As autumn officially begins, we enter one of the best periods of weather of the year, which alas lasts all too short a time. After Lisa did a round of work on the wood box refurbishment, we watched BNSF switch the small yard across the street from our house. When they were gone, we examined the results of their work. 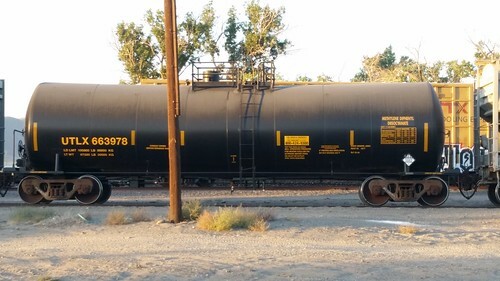 This car contains a chemical used by one of the many industries located in Fernley. 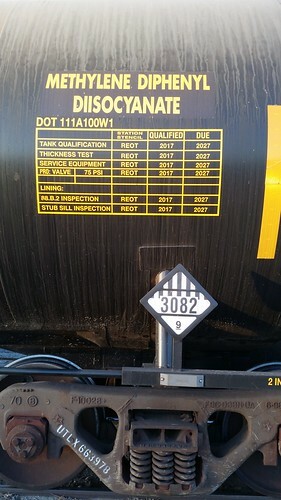 Nasty stuff, but not as troubling as the tank cars of un-odorized natural gas used as an input product to the insulation made her by Owens-Corning and R-Max. We noticed that while the BNSF crew were making up their train a hobo was wandering through. He took up residence on the sill of a bulk product car sitting in the yard. Lisa and I think he was expecting BNSF to take that cut of cars west and found himself disappointed when the crew left the cut here (it will be picked up by one of the through trains later; the "little BN" local switches local industries) and headed home to Reno. It was a lovely evening, with the temperatures just right, and no bugs. A nice evening to sit in our chairs on our front porch and watch the trains go by.